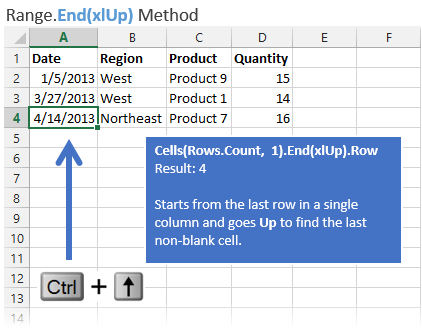 Finding the last used row, column, or cell is one very common task when writing macros and VBA applications. Like anything in Excel and VBA, there are many different ways to accomplish this. Choosing the right method mostly depends on what your data looks like. But understanding how each method works will help you know when to use them, and why. The Range.End method is very similar to pressing the Ctrl+Arrow Key keyboard shortcut. 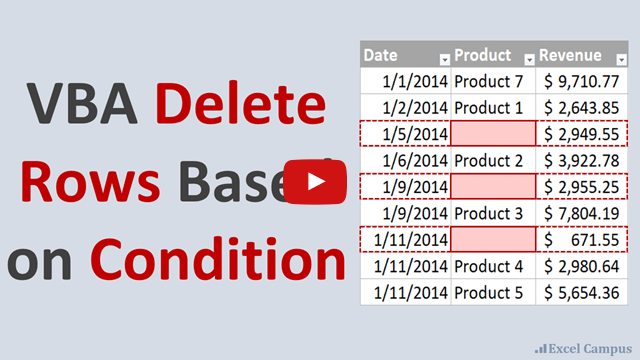 In VBA we can use this method to find the last non-blank cell in a single row or column. To find the last used row in a column, this technique starts at the last cell in the column and goes up (xlUp) until it finds the first non-blank cell. The Rows.Count statement returns a count of all the rows in the worksheet. Therefore, we are basically specifying the last cell in column A of the sheet (cell A1048567), and going up until we find the first non-blank cell. It works the same with finding the last column. It starts at the last column in a row, then goes to the left until the last non-blank cell is found in the column. Columns.Count returns the total number of columns in the sheet. So we start at the last column and go left. The argument for the End method specifies which direction to go. The options are: xlDown, xlUp, xlToLeft, xlToRight. Range.End is simple to use and understand since it works the same way as the Ctrl+Arrow Key shortcuts. Can be used to find the first blank cell, or the last non-blank cell in a single row or column. Range.End only works on a single row or column. If you have a range of data that contains blanks in the last row or column, then it may be difficult to determine which row or column to perform the method on. If you want to find the last used cell then you have to evaluate at least two statements. One to find the last row and one to find the last column. You can then combine these to reference the last cell. Range.Find has a lot of arguments, but don't let this scare you. Once you know what they do you can use Range.Find for a lot of things in VBA. 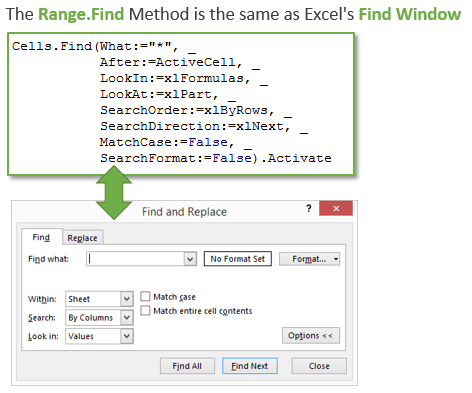 Range.Find is basically the way to program the Find menu in Excel. It does the same thing, and most of the arguments of Range.Find are the options on the Find menu. The following is the code to find the last non-blank row. 'Finds the last non-blank cell on a sheet/range. The Find method is looking for the first non-blank cell (“*”). 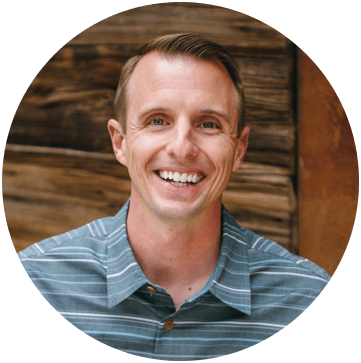 The asterisk represents a wildcard character that looks for any text or numbers in the cell. Starting in cell A1, it moves backwards (xlPrevious) and actually starts it's search in the very last cell in the worksheet. It then moves right-to-left (xlByRows) and loops up through each row until it finds a non-blank cell. When a non-blank is found it stops and returns the row number. Here is a detailed explanation for each argument. What:=”*” – The asterisk is a wildcard character that finds any text or number in the cell. It's basically the same as searching for a non-blank cell. After:=Range(“A1”) – Start the search after cell A1, the first cell in the sheet. This means that A1 will NOT be searched. It will start the search after A1 and the next cell it searches depends on the SearchOrder and SearchDirection. This argument can be changed to start in a different cell, just remember that the search actually starts in the cell after the one specified. LookAt:=xlPart – This is going to look at any part of the text inside the cell. The other option is xlWhole, which would try to match the entire cell contents. LookIn:=xlFormulas – This tells Find to look in the formulas, and it is an important argument. The other option is xlValues, which would only search the values. If you have formulas that are returning blanks (=IF(A2>5,”Ok”,””) then you might want to consider this a non-blank cell. Specifying the LookIn as xlFormulas will consider this formula as non-blank, even if the value returned is blank. SearchOrder:=xlByRows – This tells Find to search through each entire row before moving on to the next. The direction is searches left-to-right or right-to-left depends on the SearchDirection argument. The other option here is xlByColumns, which is used when finding the last column. SearchDirection:=xlPrevious – This specifies which direction to search. xlPrevious means it will search from right-to-left or bottom-to-top. The other option is xlNext, which moves in the opposite direction. MatchCase:=False – This tells Find not to consider upper or lower case letters. Setting it to True would consider the case. This argument isn't necessary for this scenario. Ok, I know that's a lot to read, but hopefully you will have a better understanding of how to use these arguments to find anything in a worksheet. Range.Find searches an entire range for the last non-blank row or column. It is NOT limited to a single row or column. The last row in a data set can contain blanks and Range.Find will still find the last row. The arguments can be used to search in different directions and for specific values, not just blank cells. It's ugly. The method contains 9 arguments. Although only one of these arguments (What) is required, you should get in a habit of using at least the first 7 arguments. Otherwise, the Range.Find method will default to your last used settings in the Find window. This is important. If you don't specify the optional arguments for LookAt, LookIn, and SearchOrder then the Find method will use whatever options you used last in Excel's Find Window. Finding the last cell requires two statements. One to find the last row and one to find the last column. You then have to combine these to find the last cell. Macro Recorder to the Rescue! Range.Find is still my preferred method for finding the last cell because of it's versatility. But it is a lot to type and remember. Fortunately, you don't have to. You can use the macro recorder to quickly create the code with all the arguments. The code for the Find method with all the arguments will be generated by the macro recorder. You can also use a custom function (UDF) for the find method. Ron de Bruin's Last Function is a perfect example. You can copy that function into any VBA project or code module, and use it to return the last row, column, or cell. I also have a similar function in the example workbook. My function just has additional arguments to reference the worksheet and range to search in. The SpecialCells method does the same thing as pressing the Ctrl+End keyboard shortcut, and selects the last used cell on the sheet. It's actually the easiest way to find the last used cell. However, this method is finding the last used cell, which can be different than the last non-blank cell. Often times you will hit Ctrl+End on the keyboard and be taken to some cell way down at the end of the sheet that is definitely not used. This can occur for a number of reasons. One common reason is the formatting properties for that cell have been changed. Simply changing the font size or fill color of a cell will flag it as a used cell. Deleting unused rows/columns can reduce file size and make your scroll bar bigger. Excel only resets the last cell when the workbook is saved. So if the user or macro deletes the contents of some cells, then this method will not find the true last cell until after the file is saved. It finds the last used cell and NOT the last non-blank cell. Well, that should cover the basics of finding the last used or non-blank cell in a worksheet. If you sheet contains objects (tables, charts, pivot tables, slicers, etc.) then you might need to use other methods to find the last cell. I will explain those techniques in a separate post. 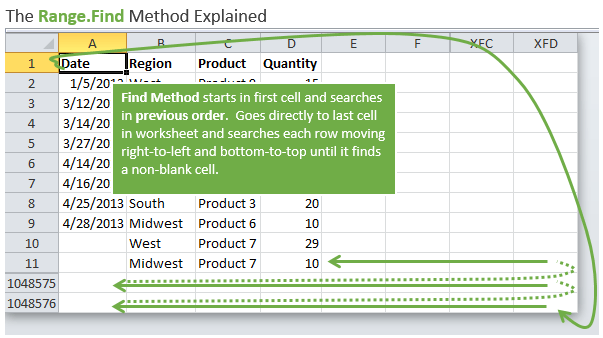 I also have an article on how to find the FIRST used cell in the worksheet. Previous Do You Use VBA? These articles are great, they are of help understanding the different approaches to address the need to find information. Just thought I would share this with you and other readers (see sub below). I’ve used your Cells.Find() method with great success, but as you mentioned, it is a lot to type out and set up. It dawned on me to collapse it into a single line for each by using the “,” argument method vs. the “Argument:=” method. As you mentioned in your article, you can ignore the last two, as MatchByte is not relevant except for obscure language characters and unless you are finding cell or font formats, then SearchFormat can be ignored. At first, I thought I would need two comma placeholders at the end of the argument list (for MatchByte and SearchFormat), but I discovered it works without them.. probably because they are in succession and at the end of the list. Defining the lRow and lCol in this way makes it pretty easy to write on the fly and does not vertically stack up your code too much. Once you write it out a few times, it is pretty each to remember and you need change only two items to go from row to column. As a reminder, I commented the reference to the nine Arguments, just as a ticker to the names and the sequence in which they must appear if using only commas. Of course, there is nothing wrong with the more stacked “Argument:=” method.. just more bulk and so more cumbersome and or intimidating to use. Putting it all in one line makes it not that much more cumbersome than typing say: lRow = Cells(Row.Count, 1).End(xlUp).Row, but you get the benefit of the returned lRow being for the entire worksheet vs. just one column of the worksheet. Anyway, I thought I would share this different perspective. I hope others find it helpful. Thanks for the great tips and the inspiration to look at things in different ways. Thumbs up! Hello, I used the Range.Find method to find the number of the last column in a row, this number being used to display the a numerical value showing how many columns the data encompasses. It works fine normally, but when I filter is applied to the rows the number of columns drops, even if all columns are occupied. I would like for it to display the same number regardless of what filters are applied, is there a way to do this? How do you find the last cell in a print range, whether used or not used? What if a worksheet has multiple print ranges? How do I go from the first to the next. I would like to navigate to the last cell in the print range and adjust the row height and column width to fill the page to the margins. Forcing the worksheet to fit to print to one page is not what I want. I am trying to use VBA to find first blank cell in a specific COLUMN and start looking at a specific ROW of a worksheet. ‘To solve the problem with the blank lines and columns we can use the ‘following code. ‘Also, if excel had many empty rows and columns, after implementing the code, ‘it is getting faster ! TThe above code is not the one I published. I do not understand how it changed. The follower codes is the right onehis is not my codes..
‘‘To solve the problem with the blank lines and columns we can use the ‘following code. ‘‘Also, if excel had many empty rows and columns, after implementing the code, ‘it is getting faster ! I’m new to VBA , please someone tell me where should i start to learn VBA , is there free sites i can go through? What would be the best way to find AND select the last last row in a range? I am attempting to enter a formula in the first row of a range and copy it down to the last row in the range? You can use a variable to store the value of the last row, then use in the range reference. There are many ways to do this, but something like the following will work. This assumes the lRow variable contains the number of the last row, which will be set in a line a code above this. It also assumes that your formula is in cell B1 and you want to copy it down. I have a bonus video at the bottom of this page that explains how to copy and paste below the last used row. Some of the techniques in that video might help you as well. What is the proper way to use these functions to when you have multiple workbooks and worksheets? We just updated from 2013 to 2016 and a lot of our projects broke due to these functions accessing different workbooks under one version than the other. Your tips are always great, specially when it comes about shortcuts! Thank you for all! Seems pretty simple and workable. Do you find any disadvantages or possible errors on this method? Hi Jon, Many thanks for this article. It has helped me greatly in preparing for my interview. Much appreciated. As now I am working on VBA code I used Cells(Rows.Count, 2).End(xlUp).Row but it show me wrong number because my excel sheet having Table style so it showing last cell of this table even it’s blank. Please help me to search non blank cell even excel having Table style. This function assumes a lot. It assumes that the header or data starts in row 1. If you have an understanding of the data that you are expecting, there is no need to check all the columns, just check the mandatory column(s) that you will be using to sort/filter the data. Either way, if you have Filtered data, none of the methods will work properly. How to find the address of the last column? This is fine for the last used cell in a row or column; however, another common need is to find the last used cell in a range of a column or row. .e.g. what is the last used cell in the range(“A5:A10”). How does one do that? Can you help to transpose this VBA code to VSTO ?